Courtesy photo Galion’s 12-U all-star team has advanced to the semifinals of the Disrict 7 Little League state tournament at Heise Park. The locals beat Clyde 18-2 on Saturday, and beat Bucyrus 6-4 on Sunday, in extra innings. Their next game is Thursday, at 6 p.m. at Heise Park. If they win, they’ll play in the District 7 championship game at 6 p.m. Saturday. If Galion loses on Thursday, the team is still alive in the tournament, but will have to claw its way into the final via the losers bracket finale. That game is 6 p.m. Friday. Members of the 12U team include, in the front row: CJ Ganshorn, Jack Karam, Carter Smith, Jayden Leach, Landon Campbell, Braylen Hart and Nick Eachus. In the back row are Coach Bill Ganshorn, Bryce Kimberlin, Justin Lester, Nicholas McMullen, Coach Dan Nay, Gage Weaver, Kooper McCabe, Drew Yetter and Coach Steve Hart. 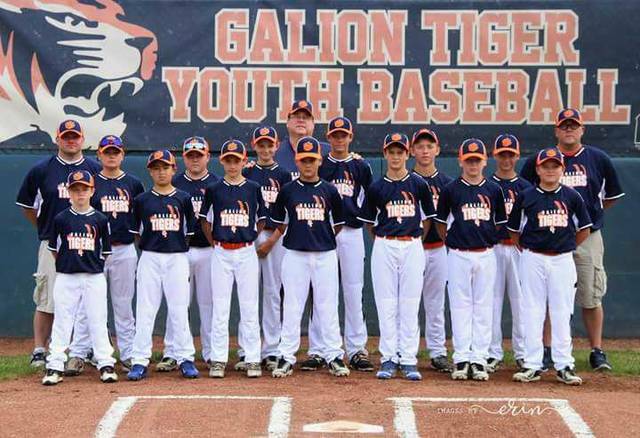 GALION — Galion’s 12-U all-star team has advanced to the semifinals of the Disrict 7 Little League state tournament at Heise Park. The locals beat Clyde 18-2 on Saturday, and beat Bucyrus 6-4 on Sunday, in extra innings. Their next game is Thursday, at 6 p.m. at Heise Park. If they win, they’ll play in the District 7 championship game at 6 p.m. Saturday. If Galion loses on Thursday, the team is still alive in the tournament, but will have to claw its way into the final via the losers bracket finale. That game is 6 p.m. Friday. https://www.galioninquirer.com/wp-content/uploads/sites/38/2017/07/web1_12U-Galion-all-stars.jpegCourtesy photo Galion’s 12-U all-star team has advanced to the semifinals of the Disrict 7 Little League state tournament at Heise Park. The locals beat Clyde 18-2 on Saturday, and beat Bucyrus 6-4 on Sunday, in extra innings. Their next game is Thursday, at 6 p.m. at Heise Park. If they win, they’ll play in the District 7 championship game at 6 p.m. Saturday. If Galion loses on Thursday, the team is still alive in the tournament, but will have to claw its way into the final via the losers bracket finale. That game is 6 p.m. Friday. Members of the 12U team include, in the front row: CJ Ganshorn, Jack Karam, Carter Smith, Jayden Leach, Landon Campbell, Braylen Hart and Nick Eachus. In the back row are Coach Bill Ganshorn, Bryce Kimberlin, Justin Lester, Nicholas McMullen, Coach Dan Nay, Gage Weaver, Kooper McCabe, Drew Yetter and Coach Steve Hart.